Description: Newcastle, Newcastle Public Library 2nd impression 1904 Plates & text illustrations reproduced from engravings by Thomas & John Bewick. 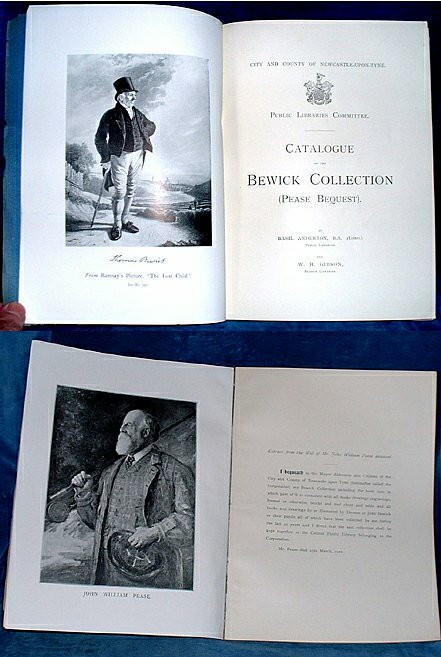 Frontis portrait of Thomas Bewick and later portrait of John William Pease (d 1901) the donor of the collection. . Small quarto original blue printed wraps (faded & chipped) iv+110pp text and all plates & illustrations on fine quality paper that is supple and white. *Scholarly catalogue of the whole collection of Bewick books and engravings in the Newcastle Public Library.